Warner Bros. Home Entertainment has officially announced the Blu-ray release of director Gareth Edwards' Godzilla (2014), starring Aaron Taylor-Johnson, Ken Watanabe, Elizabeth Olsen, Juliette Binoche, Sally Hawkins, David Strathairn and Bryan Cranston. The film arrives via 3D and 2D Blu-ray/DVD/Digital HD UltraViolet combo packs on September 16th. Synopsis: In this gritty, realistic sci-fi action epic, the Godzilla franchise returns to its roots as one of the world's most recognized monsters. Directed by Gareth Edwards and featuring an all-star international cast, this spectacular adventure pits Godzilla against malevolent creatures that, bolstered by humanity's scientific arrogance, threaten our very existence. Edwards directs from a screenplay by Max Borenstein and Oscar nominee Frank Darabont, with a story by David Callaham and Max Borenstein, based on the character "Godzilla," owned and created by TOHO CO., LTD. Thomas Tull and Jon Jashni are producing with Mary Parent and Brian Rogers. Patricia Whitcher and Alex Garcia are serving as executive producers, alongside Yoshimitsu Banno and Kenji Okuhira. The behind-the-scenes creative team includes Oscar-nominated director of photography Seamus McGarvey, production designer Owen Paterson, editor Bob Ducsay, Oscar-nominated costume designer Sharen Davis and Oscar-winning visual effects supervisor Jim Rygiel. The score is being created by Oscar-nominated composer Alexandre Desplat. Warner Bros. Home Entertainment will celebrate the release of this summer's blockbuster with a four-day interactive display at Comic Con International: San Diego on the lawn behind Hall H with entertainment and activities for fans. From Wednesday through Sunday, 8 a.m. to 8 p.m. each day, fans can view the 24-foot tall sculpture of the King of the Monsters, along with fan art and a graffiti wall where visitors can memorialize their favorite Godzilla moments. Giveaways and photo opportunities will also be available. Well everyone, it's officially announced, and it is officially here, at long last. 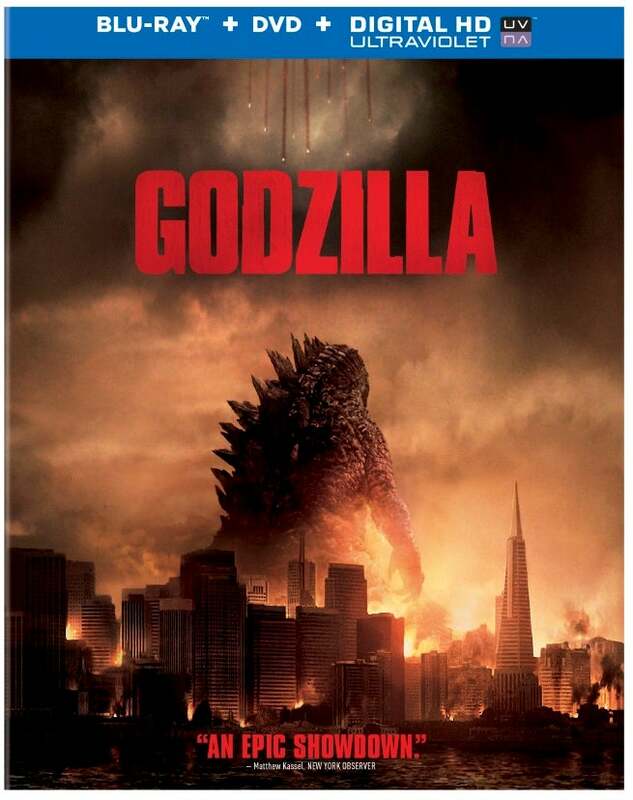 GODZILLA for Blu-Ray and DVD, rampaging this Fall to a store near you! I'm excited that there are plenty of features, although I was hoping for a bit more, like deleted scenes or a commentary by Gareth Edwards. But maybe that will come from a director's cut if one is ever brought to light. No price has been made known thus far, that will likely come to like this week at comic con, or next month.